2000년 현재 서울시의 1일 생활폐기물량은 11,339톤으로 이 가운데 45%는 재활용, 5%는 소각, 50%는 매립방식으로 처리되고 있다. 생활폐기물의 재활용을 위해서는 수집된 재활용품을 선별하고 처리하는 재활용품 집하장 및 음식물 자원화시설이, 소각을 위해서는 소각시설, 그리고 매립을 위해서는 매립시설이 필요하다. 매립시설은 인천시에 있는 수도권 매립지를 사용하고 있는데, 수송효율을 높이기 위해 29개의 적환장에서 혼합쓰레기를 대형차량으로 이적시키고 있다. 폐기물 처리시설은 대부분 구간경계, 하천변, 녹지지역에 위치하고 있으며, 강북과 강서지역에 밀집도가 높은 반면, 강남 및 강동지역에는 상대적으로 밀집도가 낮다. 이는 강남과 강동지역에서는 시설 설치여건이 양호하여 대형시설이 많은 반면, 여타지역은 소형시설이 많기 때문이다. As of 2000, Seoul produces 11,339 tons of living wastes a day. Of them 45% are recycled, 5% incinerated, and the remaining 50% buried. The treatment of the wastes requires various facilities, such as the recycling waste stations where selection and sorting of wastes takes place; food wastes recycling plants, incinerators, and the land for the burial of the wastes. 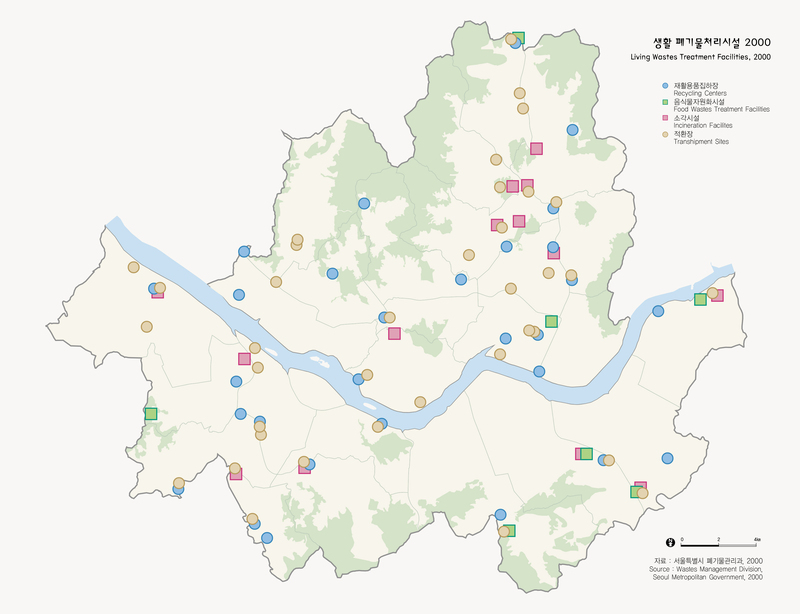 Seoul uses the Inchon waste burial ground. For transportation efficiency, there are 29 waste recycling and accumulation stations from which large vehicles carry wastes to the Inchon burial ground. Most of the waste treatment facilities are located in the boundary areas, by the rivers, and the green areas. 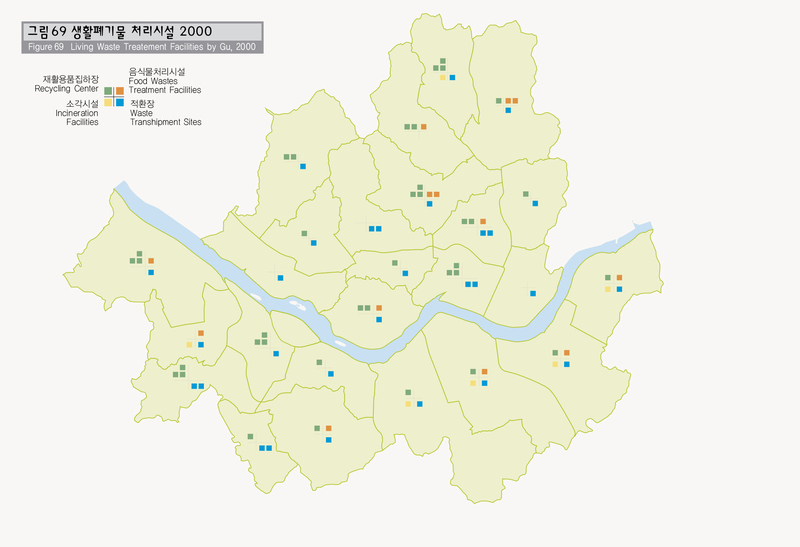 Gangbuk (north of the Han River), Gangso(west of the Han River) have a larger number of waste treatment facilities, than Gangnam (south of the Han River) and Gangdong(east of the Han River) regions. It is because their waste treatment facilities are small in capacity while Kangnam and Gangdong's are larger and more modern.